Waylon is a Project Coordinator at SERVPRO. He oversees our production team and mentors new SERVPRO technicians. He holds a WTR certification from the Institute of Inspection Cleaning and Restoration. David is a 34 year management professional successfully managing diverse employee groups and building relationships at all levels. As a Commercial Salesperson, David has put that experience to work in our booming local economy. He has worked within vertical industries involving construction project management, sales and marketing. David’s skills are exemplified through his strong desire to succeed, a high level of motivation, the ability to quickly cultivate business partnerships, and a desire to develop employees to the fullest potential. David spent 18 years in commercial and residential construction management in San Diego, San Mateo and in Colorado. David has also managed construction of two minor league baseball stadiums - i.e. Louisville and Atlantic City. He was an Assistant GM for 8 years for professional baseball teams (Reds & A’s primarily). In his free time David likes to hike, ski, cycle, sail and play tennis. He has fun at all times, and always tries his best at the challenging sport of golf. David has a fire fighting family that he is very proud of (two kids). He has lived in South and East Denver for almost 15 years and absolutely loves it. Ana is a Crew Chief at SERVPRO. 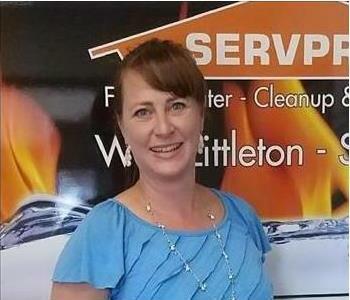 She has countless years of experience cleaning and mitigating homes affected by fire and water damage. 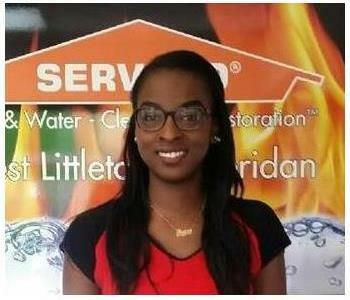 Ana is a member of the SERVPRO Storm Response Team. She helped victims of the Northern California wildfires in 2017. In her free time she enjoys spending time with her family and friends. Sarah is a Marketing Representative at SERVPRO. She meets with our insurance partners and our local business owners to make sure that we have a plan in place if the unexpected should happen. Sarah is friendly and understanding. She will take the time to listen to you and provide the best option for service. Mike is our Senior Marketing and Business Development associate. He brings over 8 years of experience in the restoration industry. Mike does a great job at building relationships between local insurance agents and our franchise so that help can be on the way quickly if an insured has an emergency. He also meets with local businesses to prepare an emergency response plan if the unexpected should happen. He will work with your business or insured to make it "Like it never even happened." Kimber is the Office Manager for our franchise. 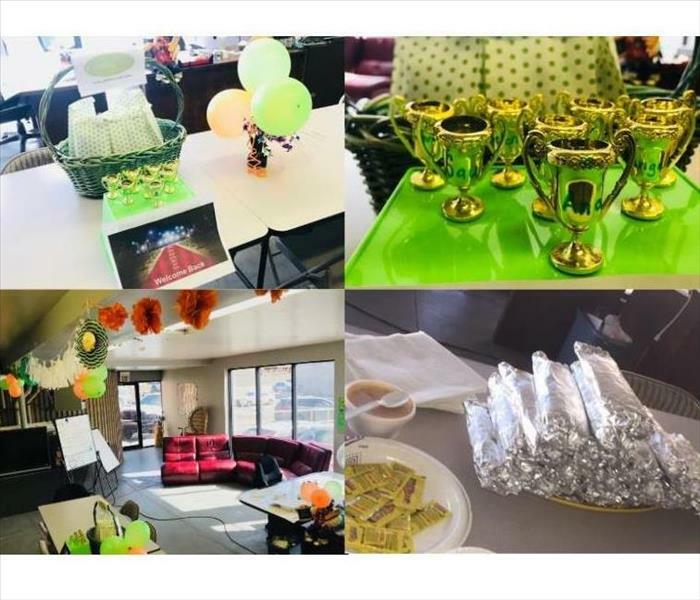 She has been with SERVPRO for over 2 years. 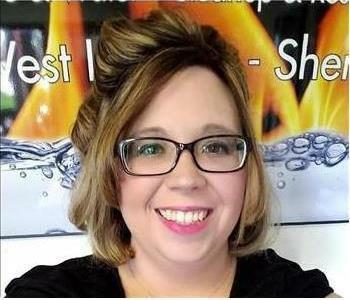 Kimber's role is to provide documentation to our insurance partners for recently completed restoration work, as well as to work with the office staff to be the best franchise we can to our customers. She is also our storm team coordinator. Kimber helped over 50 customers in Boise, ID to receive service from our franchise during a freeze storm. Kimber is friendly, efficient and happy to help. If you have a flooded basement, no problem! Call Kimber and she will be happy to get our crews on the way immediately. In her free time, she enjoys spending time with her daughter, Blakely and her fiancé, Seneca. 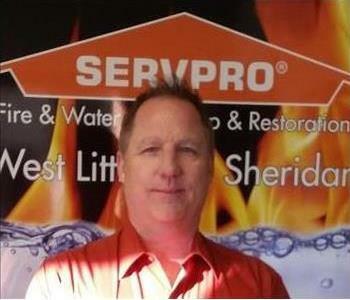 Nick is an Owner of SERVPRO of Aurora. He has several years of experience and has the following certifications from the Institute of Inspection Cleaning and Restoration Cleaning (IICRC): Water Removal Technician, Applied Structural Drying and Subrogation. 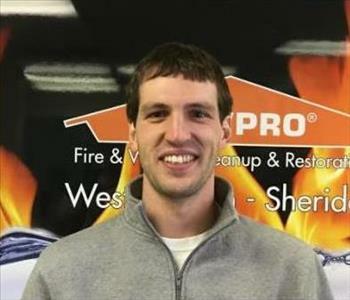 Nick also holds a CPA license and practiced for several years before owning SERVPRO of Aurora. Nick has traveled with SERVPRO of Aurora's storm team helping residents of Houston, TX for Hurricane Harvey, Savannah, GA for Hurricane Irma, Chicago, IL, and Santa Rosa, CA for the Tubbs Fire and other wildfires. Nick is always here to help make it like it never even happened. Travis is an Owner at SERVPRO of Aurora. Travis has been a member of SERVPRO of Aurora's storm team that has traveled to Chicago, IL, Houston, TX and Omaha, NE to help victims of hurricane and flood damages. 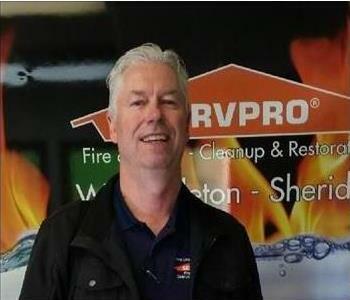 Whether you need emergency flood damage restoration, fire damage restoration, mold remediation or top-to-bottom home cleaning, you can trust SERVPRO Professionals to make your house feel like home again. They have the training, experience, and equipment to quickly get your home or business looking its best. Guillermo is a Commercial Project Manager for SERVPRO. He has worked in the restoration industry for years, and specializes in providing unique solutions to our customers. Guillermo understands that every building and customer has different needs and priorities. If you have a complex mitigation need, call Guillermo for a flexible solution and someone who has the experience working with your insurance stakeholders. Maria is one of our production technicians. She has learned the techniques of the restoration trade and helps to assist our Crew Chiefs in getting your home back to its original condition. Vonny is Assistant Director of Business Adminstration at our franchise. She came to work with us two years ago and has learned about the industry at lightning speed. Vonny helps to complete files for our insurance partners and is fast and friendly. She is a great addition to SERVPRO! Vonny is usually the first voice you will hear if you call with an emergency, such as water damage, a fire or if you find mold in your home. 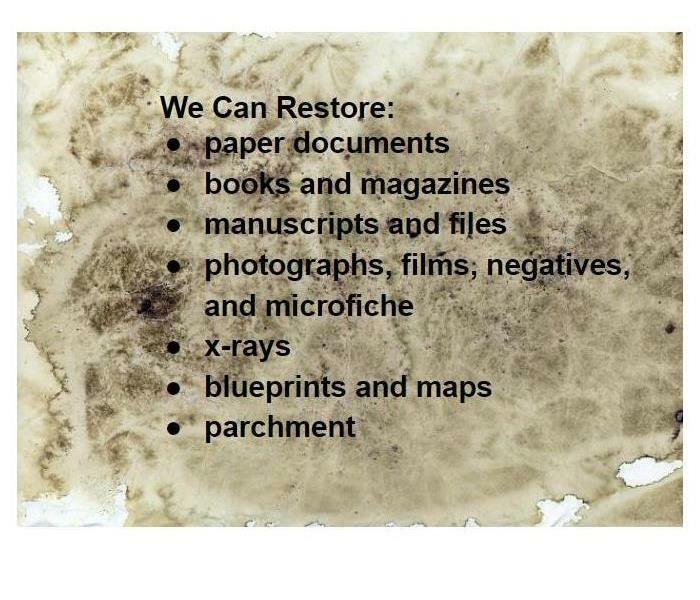 Give her the details and she will send one of our experienced Crew Chiefs to start the restoration process. DJ Kayl is our Sales and Marketing Manager. DJ is primarily responsible for business development and being a resource to our local insurance agencies, businesses and communities. DJ was the second person to be hired at the franchise and has been with us for over 7 years. DJ came to us with experience in the insurance industry and quickly became skilled in marketing and restoration. Thank you for all you do, DJ! 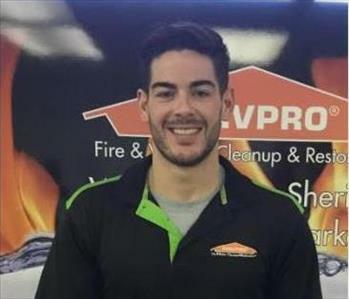 Mario is the Commercial Supervisor and Resource Coordinator here at SERVPRO of Aurora. Mario provides our crews with state of the art restoration equipment and always has useful tips! Previously, Mario was a construction manager as well as an electrician. Justin is a Production Manager here at SERVPRO. With 7 years of experience in the restoration industry, Justin is prepared to handle any size & type of restoration project.